From 1951 until its demise in 1973, the inline 6 cylinder engine was the mainstay of the Aston range. The first 2.6 litre engines were based on a W.O. Bentley design. Progressively developed and enlarged, the last was produced in 1959 measuring 2.9 litres. It was superceded by a Tadek Marek designed 3.7 litre, twin overhead camshaft, all-alloy unit in 1958. This engine also saw substantial development, it's final form being 4.0 litres in 1973. As was to become usual Aston tradition the Vantage derivative boasted higher power levels, more development and higher prices.. The "Vantage" first appeared in the sales brochures of January 1951, in the guise of a more powerful engine option for the DB mk II ( as the DB2 was first known). For over 38 years the origin of the name had remained obscure until a chance meeting at Aston Martin Lagonda in 1997. A tour of the works had been organised by a young Mr. Robertson for himself and his father, an ex-Aston employee from the Feltham days. As it transpired Robertson Sr. had in fact penned the "Vantage" moniker. Alan Robertson, newly arrived from the David Brown parent company in Huddersfield, shared an office with John Wyer at Feltham, both having arrived at the same time in early 1950. 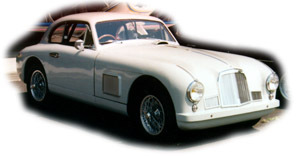 The name "Vantage" was chosen after leafing through a thesaurus looking for suitable tags for higher performance variants of the then current model, the DB Mk II. Offering 125bhp, versus 105 bhp for the standard engine, Vantage represented the tuned state for Aston Martin's fine handcrafted automobiles and was easily distinguished by a "V" in the engine number and obviously higher levels of performance. Interest in marketing the name had waned by 1953 when the Vantage engine became standard issue on the DB2/4, with no mention of it appearing in sales information, the "V" in the engine number the only indication. It wasn't until early 1962 that the Vantage name appeared once again in Aston's marketing literature. For the first time "Vantage" appeared as a distinct model name in the form of the DB4 Vantage. The Series IV DB4 was the recipient of the name; however, it represented more than just an uprated engine specification. Visually it was distinguished from the standard car by a restyled front-end with sloping faired-in headlights. Until the advent of the V8 Vantage in 1977, these were the only Vantage models to carry body modifications distinct from the standard car. Subsequent Aston Martins models of all body styles were offered with the Vantage engine option. The difference between these and the standard car was only the state of engine tune, offering approximately 10% more horsepower. From the DB5 of September 1964 onwards, through DB6, DB6 MKII and DBS these tuned models carried Vantage badges affixed to the side air intakes behind the front wheels, outwardly distinguishing them from their lesser brethren. Upon closer inspection the suffix /V can also be found in the engine number. The classic, single-headlight AM V8 saloon (no longer a 'DB', the company's post-war savior David Brown having sold the company in February 1972) appeared in May of 1972 and alongside it the AM Vantage, a tuned six cylinder car rather than a Vantage version of the V8. It represented a departure from custom as Vantage was usually reserved for the tuned version of the standard production series of car. This was unusual in the fact that no standard six cylinder car was available. It was to be another five years - and after another change of ownership - before the first V8 Vantage joined the range.